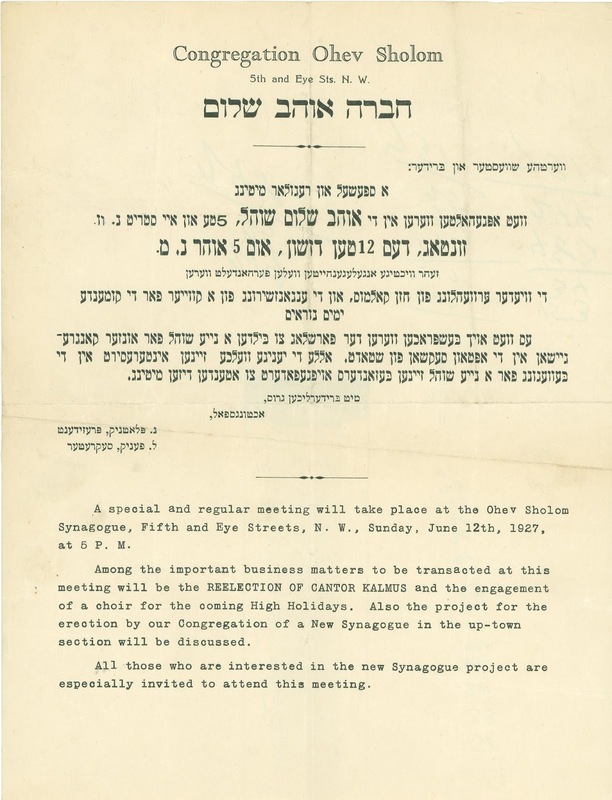 We are delighted to announce that Ohev Sholom – The National Synagogue has donated the synagogue’s extensive historical records to the JHSGW archives. Board minutes, membership files, financial books, cemetery records, photographs, and other memorabilia reveal the synagogue's long and rich history. In the coming months, our archivists will work to catalog and re-house the records in archival, acid-free boxes and folders to ensure their long-term preservation. In the meantime, join us on a sneak peek into the history of the third oldest congregation in Washington, D.C. 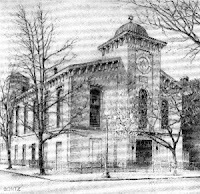 Newly arrived Russian immigrants founded Ohev Sholom in 1886 and rented temporary quarters on 7th Street, NW. 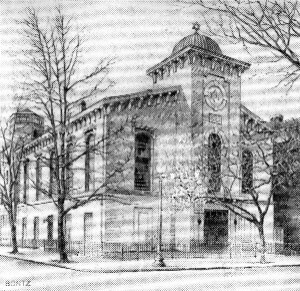 In 1906, the congregation moved into a former church at 5th and I Streets, NW (left). Across town, residents of Southwest founded Talmud Torah Congregation in 1887 and built a new synagogue on E Street, SW (right). 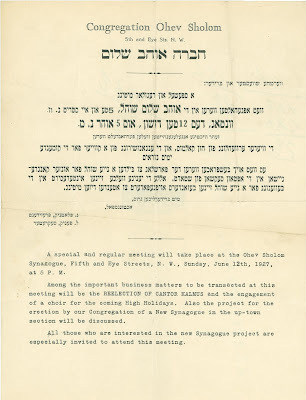 Minute books handwritten in Yiddish detail Talmud Torah's daily life in 1905, while a meeting notice for Ohev Sholom documents the congregation's efforts to hire a new cantor in 1927. During World War II, Ohev Sholom supported Russian War Relief with a donation of $105 in 1942. A few years later, in 1948, Talmud Torah Congregation gathered in the sanctuary to accept a new American flag. 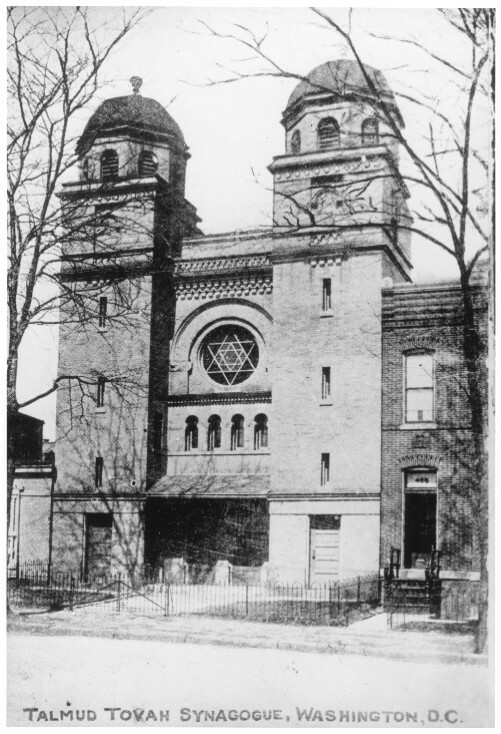 The city's two oldest orthodox congregations merged in 1958 to become Ohev Sholom Talmud Torah Congregation, and in 1960 the newly combined congregation moved into a new white limestone synagogue at 16th and Jonquil Streets, NW. An extensive series of newsletters and anniversary booklets traces the synagogue's history and growth from the 1960s through the 1990s. In 1994, the synagogue established a branch in Olney, Maryland. By 2006, the branch had become fully independent and the original congregation had officially changed its name to become Ohev Sholom - The National Synagogue. We are grateful to the congregation for this opportunity to help preserve the community's history.